Milder weather is expected later this week. THE WEATHER HAS been quite mixed of late – with both sunny days and rain in many areas. In general, it’s expected to be cold at the start of this week but much milder later in the week and into the weekend. 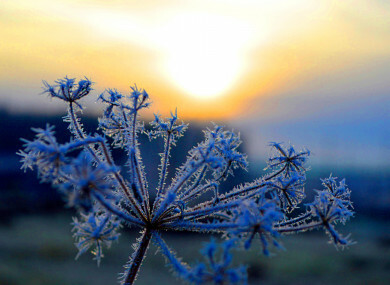 Met Éireann says it’ll be cold and clear this morning, with a widespread ground frost and some icy patches. Today will generally be dry and sunny but some local showers will develop later. Highest temperatures will range from 9 to 13 degrees Celsius. It’ll be cold again for most of tonight, with frost returning and minimum temperatures of zero to four degrees. It’s expected to become milder in the west and southwest by tomorrow morning as outbreaks of rain and freshening southerly winds move in from the Atlantic. Tomorrow will be cold and frosty at first in many places, but milder weather in the west with outbreaks of rain will spread quickly eastwards during the morning. Rain will gradually clear away eastwards in the afternoon, the winds will veer westerly and sunny spells will develop. Typical temperatures will range from 10 to 13 degrees. Tomorrow night will be cold, breezy and dry in most places, but heavy showers will affect western and northwestern parts of the country and showers will push eastwards overnight. Lowest temperatures will range from one to four degrees with ground frost in areas sheltered from the moderate to fresh westerly wind. Wednesday will be a cool, blustery day with a mixture of sunny spells and passing heavy showers of rain and hail. Highest temperatures will range from nine to 12 degrees. Showers will die away in the evening and winds will ease, followed by a chilly night with minimum temperatures of two to five degrees, with a slight ground frost developing. A warm front is expected to move up over Ireland on Thursday, bringing in milder weather for the rest of the week and over the weekend. Email “It's cold and frosty in many areas but a 'warm front' is on the way ”. Feedback on “It's cold and frosty in many areas but a 'warm front' is on the way ”.